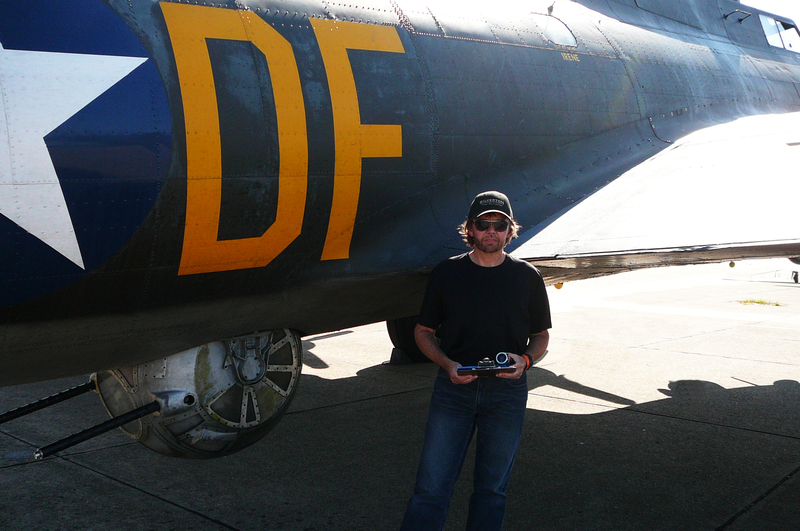 Stepping out of the B-17 Memphis Belle after a checkout flight in 2014 during the research phase of Mission. Robert Matzen takes a different approach to the traditional Hollywood biography, in part using storytelling skills honed as a feature documentary filmmaker. He also makes a commitment to get in the middle of the action and experience the subjects of his books. A 1987 visit to Errol Flynn’s estate, Mulholland Farm, resulted 22 years in Errol Flynn Slept Here, a book co-written with Michael Mazzone about Hollywood legend Errol Flynn that revealed the subject through an examination of the house he built. In preparation for his bestseller Fireball: Carole Lombard and the Mystery of Flight 3, Matzen climbed one of the most dangerous mountains in the United States, Mt. Potosi, Nevada, to retrace the steps rescuers took to reach TWA Flight 3 that had crashed near the mountain peak. Fireball surprised reviewers with its unusual take on the final days of screwball actress Carole Lombard and also its focus on others on the plane and their would-be rescuers. For his next book, Mission: Jimmy Stewart and the Fight for Europe, Robert took to the air in the cockpits of B-17 and B-24 World War II heavy bombers to get a glimpse of life in the air as experienced by the fliers of the Eighth Air Force. Mission reveals bomber pilot Stewart as a real-life action hero through 20 often-intense B-24 combat missions. Upon his return home, Jimmy Stewart went into production of the beloved It’s a Wonderful Life while still suffering the effects of what we now know as PTSD. Matzen’s media tour raised awareness about the issue, which became a focus of many interviews, with Glenn Beck and others. In 2019, Robert’s new book, Dutch Girl: Audrey Hepburn and World War II, will take audiences to a place Audrey never dreamed they would go: inside the wartime life of a ballerina in Arnhem under Nazi occupation. This time Robert traced Audrey’s footsteps in the Netherlands and dug deep into research archives in The Hague. With a pro-Nazi mother at war’s outset, and a father imprisoned for his fascist beliefs, Audrey Hepburn experienced war close-up. Matzen learned that she served as a doctor’s volunteer aide and as a runner for the Dutch Resistance. New interviews, research in top secret archives, and an alliance with Audrey’s son Luca Dotti led Robert on a fascinating voyage of discovery into experiences Audrey felt she needed to keep secret her whole life. To learn more about the reinvented Hollywood biography, explore Robert’s books and follow his blog. Robert’s Matzen’s works are published by GoodKnight Books, a boutique publisher of high quality titles about Hollywood’s Golden Era. Robert has written feature articles and movie retrospectives and reviews for a variety of publications. His national bylines include commentary on the disappearance of Malaysian Airlines Flight MH370 on FoxNews.com, and an essay about Jimmy Stewart’s frame of mind while making It’s a Wonderful Life in the Wall Street Journal. Robert Matzen has presented before audiences ranging in size from 12 to 1,200 and is available to speak before your organization about topics related to U.S. history and classic Hollywood. Contact Marina Gray at GoodKnight Books for more information. Below are samples of the 50-plus interviews Matzen conducted with the media about his books Fireball and Mission.